(Nanowerk News) Scientists from Aalto University, Finland, have succeeded in organising virus particles, protein cages and nanoparticles into crystalline materials. These nanomaterials studied by the Finnish research group are important for applications in sensing, optics, electronics and drug delivery ("Electrostatic assembly of binary nanoparticle superlattices using protein cages"; free access). Two different protein cages, cowpea chlorotic mottle virus (blue) and Pyrococcus furiosus ferritin (red), can be used to guide the assembly of binary nanoparticles superlattices through tunable electrostatic interactions with charged gold nanoparticles (yellow). Layer structures, or superlattices, of crystalline nanoparticles have been extensively studied in recent years. The research develops hierarchically structured nanomaterials with tuneable optical, magnetic, electronic and catalytic properties. Such biohybrid superlattices of nanoparticles and proteins would allow the best features of both particle types to be combined. They would comprise the versatility of synthetic nanoparticles and the highly controlled assembly properties of biomolecules. The research group also discovered magnetic self-assemblies of ferritin protein cages and gold nanoparticles. These magnetic assemblies can modulate efficiently spin–spin relaxation times of surrounding protons in water by enhancing the spin dephasing and consequently provide contrast enhancement in magnetic resonance imaging (MRI). 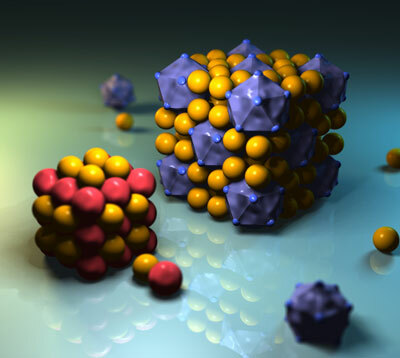 The gold nanoparticles and viruses adopt a special kind of crystal structure. It does not correspond to any known atomic or molecular crystal structure and it has previously not been observed with nano-sized particles. Virus particles – the old foes of mankind – can do much more than infect living organisms. Evolution has rendered them with the capability of highly controlled self-assembly properties. Ultimately, by utilising their building blocks we can bring multiple functions to hybrid materials that consist of both living and synthetic matter, Kostiainen trusts.